The Legend of Zelda is a franchise that has typically come in two stylistic flavours — top-down 2D/2.5D or fully 3D worlds. The latter began with Ocarina of Time while the former was common on older systems and notably on handhelds, with the DS entries shifting the top-down camera angle slightly. With that in mind NES title Zelda II: The Adventure of Link is an oddity, not just in its naming convention — dropping "The Legend of" — but also in the gameplay it delivered. With experience points, leveling and a combination of top-down world traversal and side-scrolling action, it's a formula that hasn't been replicated since in the series — unless you want to count the CDi games in some form, which we don't. It's also rather divisive, with some simply not being fans of its style or borderline crippling level of challenge. This original NES sequel was cited by Miyamoto when asked by Kotaku to name a "bad" game on his CV. The developer explained how the project failed to evolve from early planning, and outlined areas that he would have liked to be better; the first issue is related to load times on the Japan-only Famicom Disk System. I wouldn't say that I've ever made a bad game, per se, but a game I think we could have done more with was Zelda II: The Adventure of Link. ...So one thing, of course, is, from a hardware perspective, if we had been able to have the switch between the scenes speed up, if that had been faster, we could have done more with how we used the sidescrolling vs. the overhead [view] and kind of the interchange between the two. But, because of the limitations on how quickly those scenes changed, we weren't able to. The other thing, is it would have been nice to have had bigger enemies in the game, but the Famicom/NES hardware wasn't capable of doing that. Certainly, with hardware nowadays you can do that and we have done that, but of course nowadays creating bigger enemies takes a lot of effort. It's certainly a unique entry in the franchise, and evidently one that was held back by circumstances at the time. What do you think of Zelda II and Shigeru Miyamoto's comments? Remake it and make it what you want! Agreed. Zelda II had great style back in its day. I played it on a NES at a friends, I managed about 5 minutes before I gave up in boredom due that pointless overworld map and it's relatively samey villages and annoying random encounters, although I must say I only lasted about 2 hours on Zelda 1 before I gave up trying and dying. Also it would be a great game to give retro a stab at Zelda with! The hardest game in the series and it shows! Not for the light-hearted. I wouldn't mind a new Zelda game but with a Metroid twist. I feel like that's about all they can do with that kind of thing. It would be interesting to see what new weapons and items they come up with in a Zeldroid. @FineLerv Beat me to it! I picked this up for my GBA micro after completing it on the Wii VC. I wish Nintendo had the triforce of courage to make Zelda this different again. I enjoyed playing the game back in the day. Never did beat it then, maybe I should go back and play it. The only console Zelda I have never beat.....this thing is evil. I wouldn't mind a remake, squeal or a new zelda game in the same gameplay style. Though I never completed it, I did enjoy it. Zelda II is one of my favorite Zelda games ever. The difficulty makes it somehow even better. Make a remake for the eShop then. Or use another character if you're worried it's not what Zelda fans want. Just do it, it could really be amazing. A bad game could be remake into a good game sir Miyamoto. The problem with most games nowadays is that usually the good games were remake more instead of the bad ones and often or not they tend to be worst than their original which was already good to begin with. Try remaking Metroid II, Zelda II, Star Tropics, and the original Kid Icarus using today's style and gamers will be wow. To me I think the only bad game (from Miyamoto) that was ever remake into a good game was Super Mario Bros. 2, that game was bland and boring on the NES, but on SNES it had evolve into a 16-Bit masterpiece. Zelda II (my personal opinion) sucked and even free I can't get my self to play it. The die and lose your collected experience, and having to grind to get it made this unplayable for me. I loved every other Zelda though. Zelda 2 requires patience, determination, and strategy, all of which are unnecessary in Zelda games afterwards especially with the trusty fairy-in-a-bottle. It's not for everyone. I enjoy the challenge and the satisfaction of progressing, but not just for the sake of collecting things or completing meaningless tasks. I got a similar vibe from Monster Hunter Tri and Dark Souls, so I wouldn't say that this level of difficulty is unpopular or missing in all current games. One of my favorite Zelda titles.. the challenge in it just makes it that much more fun to me. It'd be cool if they remade it in one form another, even if it wasn't the same game, but a new game similar to it's style. People look at a franchise like Zelda and refuse to believe any of its games are bad. Zelda II wastes your time so much, and it's balanced horribly. Still not as bad a sequel as Simons Quest though. One of the finest entries in the series. I don't care what you say. Please remake it! I would love to see Miyamoto's complete vision of the game. I really enjoyed Zelda II. It's probably my favorite NES game (although there are many classics I have not played, as we were a SMS family). Of course the games got better with more capable hardware (and personally I think the leap to 16-bit was the biggest in terms of quality of games), but I'd rank it as a bit better than the first game. I honestly don't get the fuss made over the difficulty. I found the difficulty about the same as the first game. Man, I think Zelda II is a great game. I like the leveling up system, and the insane challenge. It's practically the definition of "NES difficult". So good. I didn't get the original Zelda until the sequel was out. At that point I got both of them together. Between the two, I gravitated towards the sequel. I really like the art direction and the side scrolling fighting. I never did beat it, though. That is, until last year when I went back and played it on my NES. I finally got through it and realized I must have become a better gamer somewhere along the line. I liked Zelda 2, but not as much as the 1st one. I'm all about a remake though, perhaps in 3D w/ expanded content? Make it happen Nintendo! Still prefer this over the first one. Hard but so rewarding when you finally clear it. I like Zelda II. Beaten is numerous times to where it's boring these days. This was one my favorite games, let alone Zelda titles, of all time! Loved it! I have to say I really loved Zelda 2 it was the first one in the series to have more than one village and possibly the only one. I would without a doubt buy a 2.5D remake of this game for both the WiiU and 3DS if I had the chance. I remember when Zelda II came out. I was amazed at the way the gameplay changed, but it was still a "Zelda" game to me. I think it is a great game. I always think of the change from Zelda I to Zelda II when people talk about the way Retro handled Metroid. For me, the Zelda series represents the pinnacle of evolving while keeping core components intact. I love Zelda 2. Number 4 on my top 5 Nes games. It's a game which requires much patience, I also love it's art style. What @arderin64 said. I love Zelda II. Easily my most played Zelda game. It has a nice skill based battle mechanic, like when you're fighting the blue knights. However, that last dungeon, with those jumping things with sword and shield. Screw that, that's rediculous, I always skip them. And unfortunately, beating the final shadow boss without using the duck in the corner approach is practically impossible. Definitely a game that could've been great. Luckily, plenty of other developers had taken up the task of perfecting the gameplay it laid out, so Nintendo really doesn't have to bother at this point. I rented it, didn't like it, and didn't get very far. Later I got it with the Ambassador games, and played it to completion. It was better than I'd first thought. Zelda 2 is still the hardest game I've ever completed. zelda 2 is pretty much awful and i have no intention to ever try to play it again, i wasnt even interested much in it as a child. theres a few stinkers in the zelda series but more often than not the games are great, so i'll forgive them for that one. though it is kind of a shame that the second game in the series was such a pain. The Adventure Time game proved that the formula can be done well. Why not make another one? Or better yet, make a brand new IP with this formula and put it on the eShop. It's perfect! I remember playing this game for about an hour, before I gave up. It was hard and bad. There are some very cool game mechanics in Adventure of Link but it's not as balanced as most the other Zelda games. The opening overworld looked bad to me even when it was first released. It's also punishingly hard and had an unfortunate mechanic regarding "extra" lives. The original Zelda game is a masterpiece and still holds up, however. It's only misstep is the last couple of "Levels" as they are a tad monotonous. The process of learning the ins and outs and gaining the skills and familiarity NOT just items makes it a great experience over and over and over. Do not mock. Zelda 2 is my favorite game and quite frankly was perfect the way it was. Sure, it could have been better, but EVERY GAME COULD HAVE BEEN BETTER. So... kind of a useless argument. Only played it at a friend’s house... it was weak! I agree with Miyamoto. I also hated how Y's III tried to match it... just not my style of adventure. LOVE "ZELDA II"!!!! First played through the game via . . . unconventional means in 2007, on the game's 20th anniversary. Since then, I bought the game on the Wii Virtual Console, as well as the 3DS Virtual Console, and have probably completed the game nothing short of 20 times, including several 000 death run throughs. Miyamoto is right - all the enemies are the same size as Link. I could see Miyamoto and his team doing all sorts of cool new things with a new Zelda II type game. One thing I would love to see is a use of weapons - all Link has is his sword. The items that he gets are mostly only functional in the Overworld and have no real legit use in the side scrolling sections. Imagine incorporating a boomerang, a hookshot, or bow and arrow! Totally radical. And while you do that, fund ANM2. @LDXD Doh. Yup, thanks. Fixed it. It's also The Adventure of Link, not Adventures so there! Must be I have that LttP sequel on my mind. I actually do like Zelda II overall. I would love to see them try again with the modern technology. In fact, I think there should be more of these maybe as eShop sequels in the tradition of the old games. Metroid is way over due for a side scrolling sequel. The Adventure of Link was a huge disappointment to me when it first came out, in fact I still consider the original Legend of Zelda to be the superior game...but it does have it's charm and after I mastered it I did enjoy it enough to play it through several more times. One of the few Nintendo games best left forgotten... bury it.. and never let it come out again..
@LDXD If they can remake the original NES Metroid and come up with something as awesome as Metroid Zero Mission on GBA, I'd love to see them go from Metroid 2 to Wii U and/or 3DS. For the most part, however, I want new games. I like the Zelda: A Link Between Worlds approach. Same style of gameplay and same aesthetics but new challenges, technology, and story. Wow. Seems like you either love or hate this game. Well, there's only one way to "fix" that problem...update and expand it! Zelda II is a game for those players that enjoy a truly challenging game. This game will make you want to break glass and eat it before you pick the controller back up and head ALL the way back to your dungeon. I personally loved the game, and still think it was very well made. However it is NOT for the faint of heart. And perfectly good games like the original TLoZ, Ocarina of Time and Wind Waker get remakes? This is the only zelda game that deserves a remake. 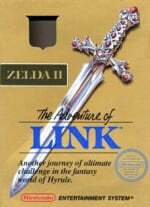 I imagine a remake with a mix of Link's abbilities in SSB like the down and up thrust, the spin attack, and smash attacks; the inclusion of the old and new items which Zelda II didnt even use; sprinting and jumping like in SS, and more develped story which neither Zelda I or II explained a lot. If not for Zelda II Link wouldn't have some of his best Smash Bros moves!! Make it longer and less hard in 3d. One of the best Zelda games. A remake or better a sequel would be great! I'm a huge fan of switching between perspectives in games, so the whole thing Zelda II does with going from top-down exploration to sides-scroll battling and dungeon exploration is something I treasure, even if Miyamoto thinks it could've been improved. Other games (and favorites of mine) doing the same is the Gargoyle's Quest series and a couple of the Tale Of games. This kind of breaking games up structurally has almost disappeared though, which is a damn shame as it's much easier to do it now than it was back in the day. Adventure of Link is easily one of my favorite Zelda games. Heck, I prefer it over Lttp, OoT, WW, LoZ, and several other titles. When I was a kid and it came out, it was way too hard for me, but I gave it another chance a few years ago and was absolutely hooked. And I don't normally like RPGs, but the leveling system in this game is great. @mikeyman64 i agree with you about wanting to eat glass. I enjoy it very much! It's extremely clever and unique, and I think even more fun to explore than Zelda I. The difficulty is pretty rough - I've gotten to the final boss but never beaten him. In hindsight, I really enjoy Zelda 2. I wasn't a fan of it at the time, but I would like to see Ninty do a 'sequel' for it, using the same style, just to see how they would make it today. But please, keep the difficulty level! I love this game! I would be overjoyed to see something done with it. You know what you should do then, Miyamoto! Create a new, Link's adventure like Zelda game! It could work, if done right! I think this game is good. I hope the 2D bits in the new 3DS Zelda are like this sort of thing with a similar type of difficulty. (A school friend of mine finished it when he was 9 years old so it cannot be that hard). I like games where the only way to progress is to get better at playing the game and they seem to be sadly lacking these days. (The game in Warioware DIY Showcase from Zelda 2 is probably my favourite). I amazed to see so much Zelda 2 love in the comments, alot of people tell me they hated it. (lol) Usually the reason being it's "to hard." I actually thought it was easier then Zelda 1, once you get used to using Link's shield to block the Iron Knuckle knights' attacks. Plus the game had a clearer idea of where to go next, and better hints from the NPCs, instead of just running around blindly like in Zelda 1 hoping you find the next dungeon. Me and my brother took turns on his title when were kids, eventually able to beat it after a week or so.... Loved it. I wished Zelda games kept the more RPG elements of Link continuosly getting stronger and leveling up. @Fazermint Spirit Tracks is amazing, trust me. @Captain_Toad Did you replay it now on the NES app on the switch since they have the "Special edition"? @DudeSean I bet you're happy that they re-released it Switch then. Did you have any idea 6 years ago when you wrote this, that one day you could have it with you every day in a portable format or on tv? long before it got to the app with almost no savestating. Not going through that again. Im sure others will appreciate the special edition. Heh, we won't blame you if you play the special edition. @Captain_Toad I love that this is a almost 6 year old thread and we just breathed life into it. I just randomly saw the link for Zelda II and clicked it and here I am. @ouroborous Have you thought about trying it again now that on the Switch it has the "special" game that boosts your skills to make it easier. I think it will make it more fun. Massive Zelda fan here - I will say Zelda II is the only Zelda game I dislike playing. HOWEVER, this does not make it an inherently bad game, regardless of the 3/10 rating I bestowed upon it in my personal collection. That rating only reflects my personal opinion on the enjoyment I have, not on the actual quality. Could it have been better? Yes. Even the best games ever made - Twilight Princess, The Last of Us, Super Mario 64, to name a few out of many - could have stark improvements made to them. But I think Zelda II still holds an important place in Nintendo's history, and it was a time long ago back when Nintendo was less afraid to try new things. One could argue that Breath of the Wild is trying so many new things - but when you get to the nitty-gritty, aside from freedom of choice, an open world, and... well, jumping... Breath of the Wild just carries on the same tried and true formula Ocarina of Time established. Zelda II is the only vastly different Zelda game from all others. And that's important.